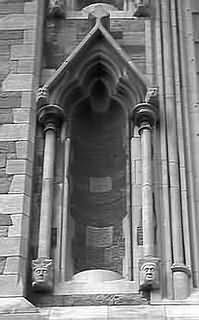 Images of Saint Patrick's, Church of Ireland Cathedral in Dublin. 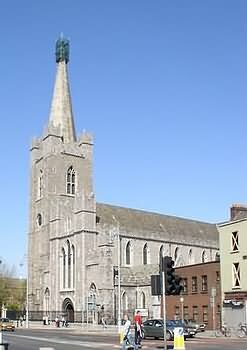 Built on the Poddle river which flows under the building & the site of an earlier 5th century monastic settlement, it was founded in 1191 by Archbishop John Comyn and officially declared a cathedral in 1213. 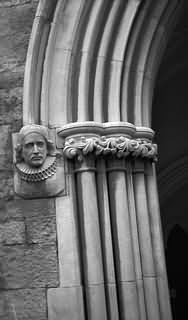 During the 18th century Jonathan Swift, author of Gullivers Travels was Dean of Saint Patrick's between 1713-1745. 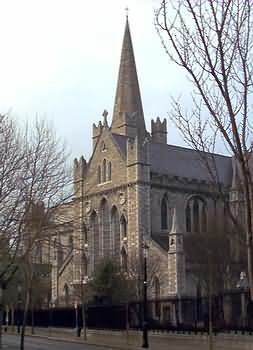 Later that century the steeple height was extended and the spire added to the structure. (It is 200ft high). When during the 19th century extensive renovations were undertaken between 1860-1865, a Celtic Cross marking the location of St. Patrick's Holy Well was discovered. 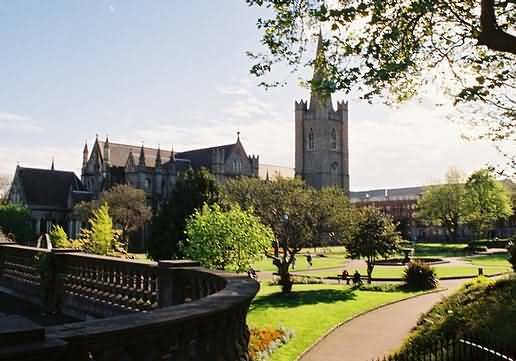 Guinness Brewery founder Benjamin Lee Guinness ( 1798-1868 ) contributed an estimated £130,000 towards the cathedral's restoration & provision of the adjoining park area. 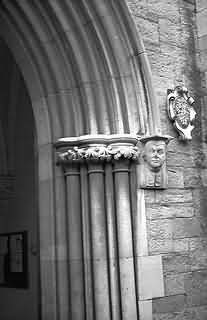 View of decorative stone carvings at Cathedral entrance & exterior walls. View a photo-guide of famous Dublin landmarks, with location & history details. Irish posters & Ireland photo gallery - main contents.